In 1916, the Kansas City Macaroni Company merged with the Denver Macaroni Company and the American Beauty® Pasta Company was formed. Rocco Sarli, an Italian immigrant, was at the helm. John Vagnino became a part-time owner. During the Great Depression, the company had the single largest geographic distribution of any American pasta brand. American Beauty® remained in the hands of its two founding families, the Sarlis and the Vagninos through the mid-1960s. 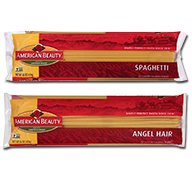 American Beauty® products are manufactured at plant locations in Fresno, California, and St. Louis, Missouri, and its pasta is distributed throughout every state west of the Mississippi River. It is a leading brand in a number of regions. American Beauty® is part of the Riviana Foods Inc. portfolio of pasta and rice brands. With pasta meal solutions for every taste and diet, we have something for your whole family. Enjoy the adventure and get creative! In addition to classic white pasta, we also produce: gluten-free pasta, organic pasta, whole wheat pasta, noodles, high fiber pasta, veggie pasta, ancient grains pasta and reduced calorie pasta. Our principal pasta brands include: Creamette®, Light 'n Fluffy®, Mrs. Weiss®, No Yolks®, Prince®, Ronzoni®, San Giorgio®, Skinner® and Wacky Mac®.